Mere weeks after premiering the third season of “House of Cards” to addicted fans everywhere, Netflix is back to ruin another weekend by hooking you into a twisting, turning thriller with an amazing cast, theatrical production values, and a pace that makes it so easy to turn to your TV-viewing partner and say, “Let’s just watch one more.” In fact, based on the first three episodes of “Bloodline” available for press, I would even say this show is more addictive, engaging, and overall impressive than the rocky Junior year of the Kevin Spacey vehicle. From the creators of “Damages,” “Bloodline” is a drama about family ties that bind and kill with one of the best casts of any program in years, including Sissy Spacek, Sam Shepard, Ben Mendelsohn, Kyle Chandler, Chloe Sevigny, and more. It is a marvelous example of how important casting is to successful television in that these talented actors ground their characters so well that the flaws of the narrative are easy to overlook. 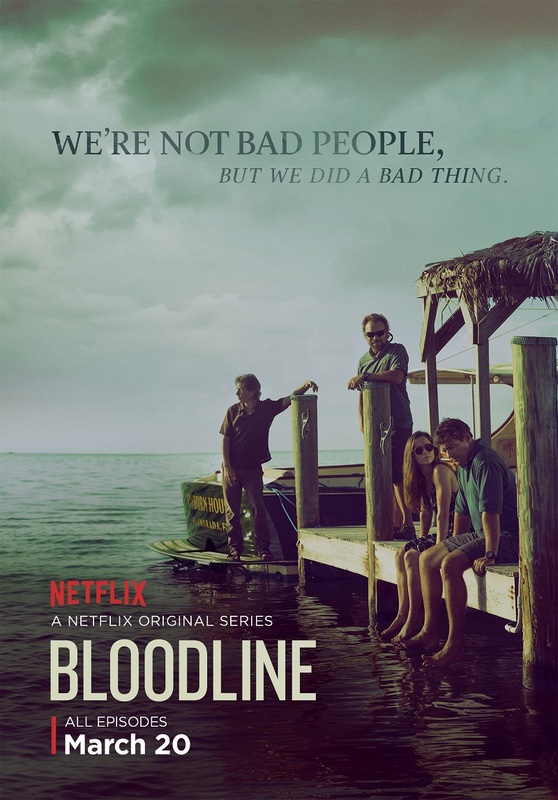 The premiere left me a little concerned that the overheated dialogue and drawn-out mysteries of “Bloodline” would frustrate me too much in the long run. By the end of the third episode, I would have dropped my plans for the day to watch at least one more. Those opening words spoken by golden son John Rayburn (Chandler) set the stage for “Bloodline,” a show about how family history impacts present-day behavior. The brother in question is Danny Rayburn (Mendelsohn), the one who left years ago in a haze of criminal activity and disappointment. At the family reunion to which he returns, even dear old dad (Shepard), after saying a few kind words about his “good kids,” says about Danny, “He always finds a reason to come back…even if it is to ask for money.” John and Danny may be the moral polar opposites of the Rayburn clan but there are two children in between, attorney Meg (Linda Cardellini) and hothead Kevin (Norbert Leo Butz). And matriarch Sally (Sissy Spacek) just wants everyone to get along, even if it’s only for the duration of the reunion. It turns out that Danny wants to turn over a new leaf. He wants to come home and help mom and dad with the family business. Kevin immediately senses this is a bad idea, while the more kindly Meg wants to give him another chance. John, ever the peacekeeper it seems, is stuck in the middle. Meanwhile, the writers of “Bloodline” play with chronology, flashing forward to a rain-soaked night when things go very badly, and flashing back to a traumatic family secret that shaped everything that is happening now and will happen later. 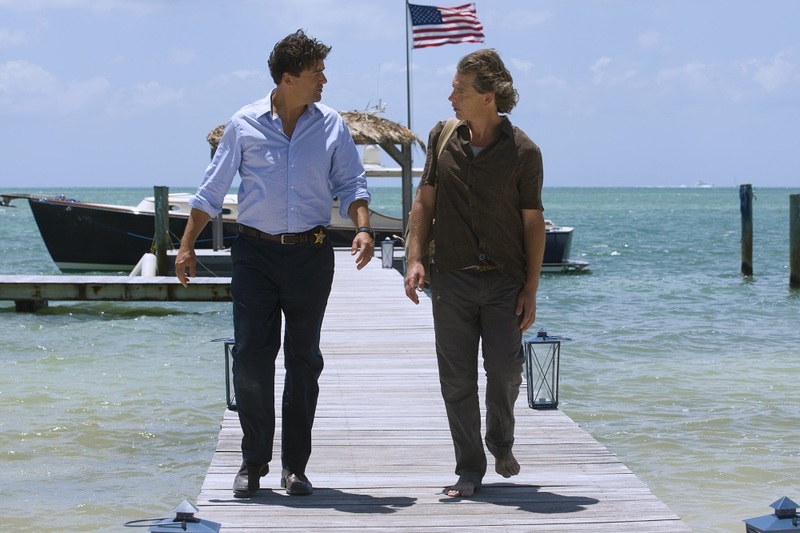 There’s an undercurrent of inevitability in “Bloodline” that is thematically rich. Is Danny a bad seed himself or because his family practically forces him into that role by labelling him so? Are we really something of a product of what our families tell us we are? It’s almost as if the Rayburns push Danny into bad behavior, such as with his ex-con friend Eric (Jamie McShane), who wants his buddy to help him with some criminal activity. The premiere is weighed down with a lot of character set-up, taking place mostly at the reunion and focusing on the dynamic between John and Danny. While the next two episodes are tighter, thanks in no small part to an interesting narrative twist that ratchets up tension in the family, there are things that work right from the very beginning, mostly thanks to the cast. The always-great Mendelsohn seems to be developing even further as an actor after great performances in films like “Animal Kingdom”, “The Place Beyond the Pines”, and the upcoming “Mississippi Grind”. He is riveting here, perfectly portraying a man who has often sabotaged his own chances for redemption while also realizing that his family has not exactly opened their arms to save him. The creators of “Bloodline” know how unique that family dynamic is in that everything is exaggerated within a family tree—both the support and the judgment, often in the same sentence. Watch how Mendelsohn behaves differently when he’s around his family, trying to impress them while also resenting the fact that he has to do so. He may be the best thing about “Bloodline” but he’s far from alone. Chandler, Shepard, Spacek, Cardellini—they’re all perfectly cast, and relative newcomer Butz is effective as well. There’s not a false beat in the cast, although the show does start to feel a bit too focused on the family itself, often missing opportunities to let the Florida Keys and its inhabitants play a role in the narrative. Each of the first three episodes seems to focus on a different member of the cast with Chandler taking the first, Butz the second, and Cardellini the third. It’s a smart structure, allowing different performers time in the spotlight and breaking up what seems to be a relatively straightforward story into an episodic structure. Some will dismiss “Bloodline” as pulp fiction, the material of airport book store bestsellers. With its buried family secrets, exploding boats, and stormy nights, it’s kind of impossible to deny those charges. Some of the dialogue feels straight out of a mass market paperback, especially over-written narration like “It wasn’t just him I was trying to save, I was trying to save myself.” However, crafting that kind of escapist thriller effectively is harder than intellectuals might have you believe. It takes a rhythm, pacing, and structure that keep you going despite knowing it’s all a little overheated and ridiculous. You don’t necessarily have to buy it, but you want to keep moving, largely thanks to the actors selling a car that you might know is a lemon but they convince you to keep going, just to see what’s around the next bend.